"My trip was just FANTASTIC. I'm so happy I chose Gangga again. The welcome was terrific. They treated me just wonderfully, with gifts and a free massage. Hanne, the owner, is such a lovely woman and I got to know her a little bit better. On the dive in Lembeh I tagged along with her and she showed me an "electric clam," something I had never seen before. 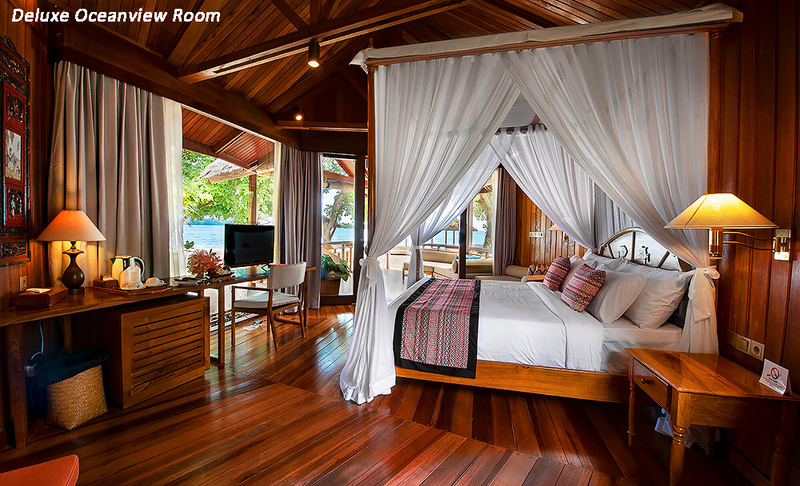 Gangga Island Resort is as beautiful as ever, and reflects Hanne's loving personality. This was my best dive trip ever! Thanks again for arranging a fabulous trip. We are definitely going back!" "We just made it home from Gangga Island, and want to return some day soon. We had a wonderful vacation with fantastic diving. You are right. Gangga is ideally located between Lembeh and Bunaken (we were able to go to both dive sites), but the islands right around Gangga had the best diving of all three! The resort is world class. Gaspare (the GM at Gangga) keeps that resort running well. "We really liked staying at the Ambassador Transit Hotel in Changi Airport for our seven hour layover in Singapore. Wow...what an airport! The Shangri La Hotel (in downtown Singapore) was quite pleasant for the longer layover on our way home. 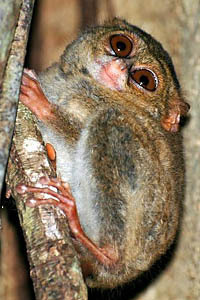 "I also want to thank you for mentioning the Tarsiers. I asked Garpare whether we could arrange a trip after diving at Lembah. Since we were the only divers, he had no problem stopping for a few hours at sunset to go find the Tarsiers. It is quite the jungle adventure hike to find them, especially when starting from the beach where the boat dropped us off. We did find the Tarsiers and I was able to get a couple of cute photos. Attached is my favorite pic. Thanks again for arranging a fabulous trip. We are definitely going back!" "The service at Gangga Island Resort & Spa was amazing! The genuine care the hotel and dive shop staff had for our time, dive gear, and vacation experience was simply wonderful." 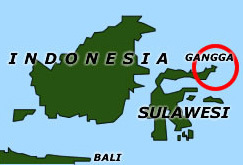 Gangga Island Resort & Spa - On the tip of a small island near Manado in North Sulawesi lies Gangga Island Resort & Spa. This exotic resort boasts an exclusive cluster of beachfront bungalows tucked under shady palms and surrounded by tropical gardens. 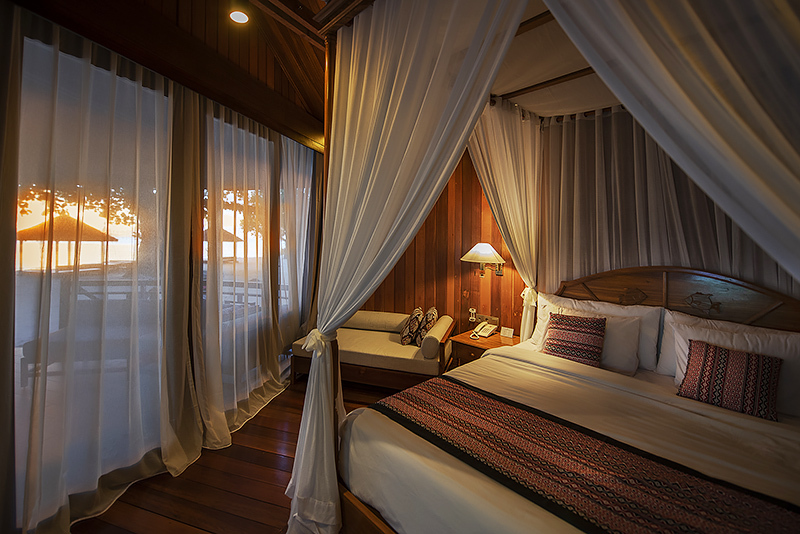 The resort features 15 spacious and luxurious bungalows, each with two private guest rooms and a delightful veranda overlooking the beach and picturesque neighboring islands. An in-house dive operation is ready to serve all your scuba diving and snorkeling needs. (A description of the diving, and a Gangga Island Photo Gallery are to be found a bit farther down this page). Manado, Lembeh Strait, Bunaken & Bangka...A Diver's Paradise - Gangga is an ideal starting point for diving the sites of Bangka Island, Bunaken National Marine Park, and Lembeh Strait. Known to be an epicenter of marine biodiversity, in this region you may enjoy sensational diving with a truly remarkable array of marine life. A diving experience unparalleled in the world awaits you, everything from blue water to bizarre creatures, as you select among these diverse and exciting diving options. 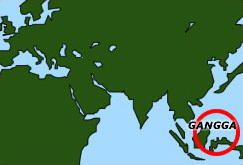 Getting to Gangga - International flights connect from Los Angeles to Singapore or Bali. From there fly Silk Air or Merpati to Manado. From Manado International Airport, the transfer is one hour by car, then half an hour by boat. Our Gangga dive package includes round-trip transfers from Manado airport to the resort. Contact Island Dreams for discount airfares and complete information. Package Pricing - Your Gangga package includes airport greeting and round-trip transfers, lodging based on double occupancy, hotel tax and service charge, three meals daily, and boat diving as indicated. The following prices are per person in U.S. dollars, based on double (twin share), or single, occupancy. based on occupancy indicated Room Style Single Occ. Prices are per person, based on the occupancy indicated, include 21% tax & service, and are subject to change. Package includes airport transfers, tax & service, 3 meals daily, and boat diving as indicated. Packages of 7-nights or more include round-trip transfers between airport and resort. Ken Knezick Describes Gangga's Diving Options - From a diver's perspective, the best aspects of Gangga Island Resort are the scuba diving options it affords us. 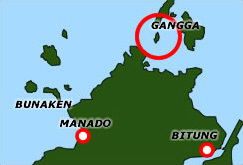 Nearby are the islands of Bangka and Talise. These offer some of the most beautiful soft coral diving to be found. While large fish are somewhat scarce, you will find fields of pristine hard corals, a variety of reef fishes, and forests of large and colorful soft coral trees, truly a delight to behold. The smaller island of Lihaga, a short boat ride away, afforded me the best Mandarin fish dive I've ever had. (See Ken's Mating Mandarin Fish Photo Gallery). Gangga Island Photo Gallery. Copyright Ken Knezick. Photographed at Bangka and Talise Islands. All rights reserved.